Advantek’s U.S. Design Patent No. D715,008 covering the above-pictured “pet gazebo” that Advantek also sells as its flagship product. Long-Walk allegedly copied the design in its “pet companion” product. However, the district court dismissed the case on the pleadings — finding that the prosecution history barred any infringement finding. On appeal, however, the Federal Circuit has reversed. This is one of the few cases considering prosecution history of a design patent. 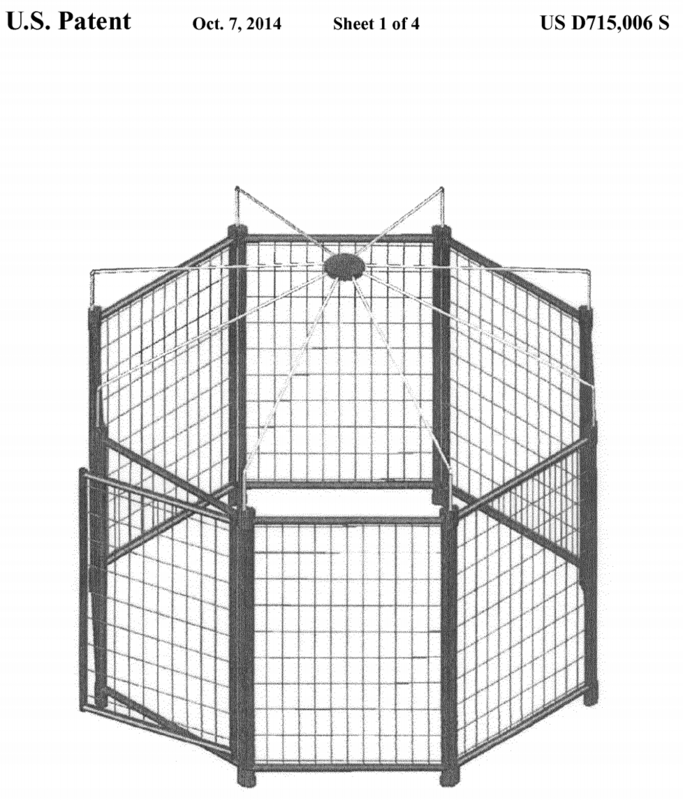 The Prosecution: The design patent application included Figures 1-4 (kennel without a cover) as well as Figure 5 (kennel with a cover) and explained that the embodiments are identical except for the cover. In its initial action, the Examiner issued a restriction requirement dividing between Group I – Figs 1-4 (kennel without a cover); and Group II – Fig 5 (Kennel with a cover) — finding that the two groups are distinct embodiments and further that the single claim requirement of design patent bars the inclusion of figures having distinct combinations of elements. The applicant “disagreed” but still elected Group I and withdrew Figure 5. The patent issued without the applicant filing a divisional application to cover the withdrawn claimed figure. Note here that the figures of a design patent are effectively the claim — thus any amendment to the figures is also a change to the claim scope and coverage. In the litigation, Walk-Long’s product does have a cover and the basic question is whether the design patent can cover a product with the cover — knowing that the patentee originally claimed a kennel with/without a cover – but but then dropped the with-a-cover portion. Doctrine of Surrender: In Pacific Coast Marine Windshields Ltd. v. Malibu Boats, LLC, 739 F.3d 694 (Fed. Cir. 2014), the Federal Circuit explained that prosecution surrender does apply in design patent cases. Here, however, Advantek argues that its design without-a-cover is present in the accused kennel (as a substructure of the whole). Although Walk-Long sells the kennel with a cover, it is first assembled without the cover — and remains without a cover until the cover is installed. Although eliminating the cover appears to actually broaden the claims — the appellate court did not particularly decide whether there was surrender. Rather, the Federal Circuit determined that at a minimum, anything surrendered was outside the scope of the accused product. Regardless of whether Advantek surrendered claim scope during prosecution, the accused product falls outside the scope of the purported surrender, contrary to the district court’s conclusion. Advantek elected to patent the ornamental design for a kennel with a particular skeletal structure. A competitor who sells a kennel embodying Advantek’s patented structural design infringes the D’006 patent, regardless of extra features, such as a cover, that the competitor might add to its kennel. On appeal, the Federal Circuit noted particularly that a claimed article of manufacture can include a whole product or components thereof. Samsung Electronics Co. v. Apple Inc., 137 S. Ct. 429 (2016); Gorham Manufacturing Co v. White, 81 U.S. 511 (1872). BTW, this is apparently just another example of a U.S. company going to China to set up a Chinese company to manufacture its products cheaper, and then being surprised when that Chinese company just kept on making and selling the same product in direct competition, with the U.S. company with only what little IP it had to try to protect itself. What did they expect? So the roof would appear to have little value with no structure to support it. The cage is still USEFUL without the roof, I guess. Supporting the roof is a utilitarian function not protectable by design patent. Are we supposed to apportion out the aesthetic value of an octagon versus some other shape like a hexagon? Patent damages are even more of a mess for design patents than for utility patents. Are we supposed to apportion out the aesthetic value of an octagon versus some other shape like a hexagon? Welcome to the absurd world of design patent law. Don’t worry — design patents are just a tax that will passed along to you and people poorer than you. The rich get richer and everyone else can s-ck it. It’s the American way! Your Ism is showing again Malcolm. Yep, and this is why the 52 Act went to a “no less than a reasonable royalty” catch all. Because under the old law, infringer ‘profits’ were recovered by the patent owner but apportionment applied so far as the profits were concerned. Anyways, it became unworkable – as it created an incentive for infringers to resist discovery and create long complete apportionment fights. But here we go again, this time with the CAFC leading us into the error of apportionment and compounding the error with apportionment of the “no less than a reasonable royalty” baseline. Design patent law needs to be expunged from utility patent law. Until that happens, ALL attempts at applying the law based on utility towards those things expressly not utilitarian makes a muckery of both. Agree 100%. Design registrations are meant to protect ornamental, non-functional aspects of something. There’s no place for an obviousness analysis, only a novelty analysis, which is how the rest of the world examines applications for design registrations. Calling it a “design patent” leads to confusion in both examination and enforcement. And while Congress is at it, please update the damages portion of the statute regarding registered designs to something sensible. Anything non-obvious about that design? As Dennis noted in a prior study and blog, design patent applications rarely get PTO 103 rejections. Since this suit never got past the pleadings stage, and apparently no IPR was filed, it presumably goes back to the D.C. for novelty and obviousness issues. I traverse the rejection due to a lack of substantial evidence. Rejection reversed. I think that was pretty good for three seconds. Different grid spacing, legs, number of sides —- these are all known design options in the art, nothing creative or ornamental about the choices here which are mainly utilitarian. Seriously if you think this is a non-obvious design for a pet cage then you were either born yesterday or you’re trolling. Malcolm, you’ve never commented upon something that you haven’t deemed obvious, yet you also never actually back up your conclusion with references. You haven’t earned “trust me” authority. If you want to label that trolling, I’ll wear it. You alight upon Malcolm’s number one meme: Accuse Others Of That Which Malcolm Does (or Is). A solid 13 and a half years of this blight…. “..not octagons, different grid spacing, different legs” etc. are the sort of arguments that seem to fly as to design patents. It should indeed apply for design patent infringement testing, but begs the question of why such minor and non-novel [even dimensional] differences in otherwise very similar and well known hinged animal fencing would be 103 UNobvious ORNAMENTALY to a product designer of ordinary skill in the art, but obvious to a 103 POSITA if it were a utility patent application on the same fence? It is hard to argue that professional product appearance designers are more clueless than ordinary mechanical engineers when many are both. US. design patent applications are subject to the same 103 statutory requirements as utility patent applications, yet too often treated differently. The Fed. Cir. still even applies a unique old non-statutory “best single reference” 103 test for design patents. The problem comes from trying to apply a utilitarian law to a non-utilitarian scheme. All that you will get – all that you CAN get – is muckery. Changing from current U.S. design patent protection to only a copyright-like protection is not on any legislative agenda, and no commentator here has any known political influence. So, the only realistic reform path is for some design patent defendant to finally take a Fed. Cir. design patent validity decision to the Sup. Ct. “woodshed” as was done in KSR, etc.. Wanting to unmuck things through the Supreme Court is laughable. So while it is true that no current reform path has the attention of politicians, your recommended path is NOT the answer. I see that path as only making things worse.